Swimming is a hugely competitive and popular sport. In keeping with this high level of competition, tracking of results and training progress are extremely common. These stats are utilized to both track and improve performance. Of course, to do this you need a good, accurate stopwatch. The stopwatch also needs a couple of extra considerations, such as water resistance and the ability to survive being dropped on hard floors. Without these, it won’t last very long in a swimming setting. 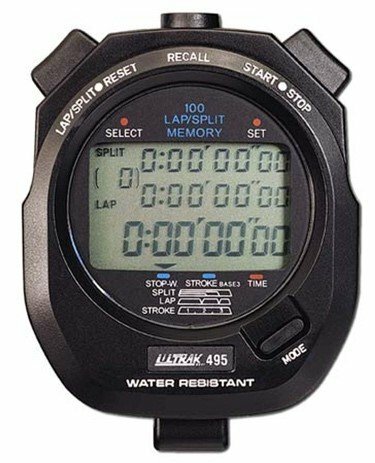 Having considered those features, our top suggestion for a swim stopwatch would be the Ultrak 495 Stopwatch. The Ultrak 495 would be my absolute top pick as a stopwatch for swimming use, though there are some alternatives depending on your personal preferences. If you’re interested in any other swim equipment, why not take a look at our best swimsuits for men or best for women? 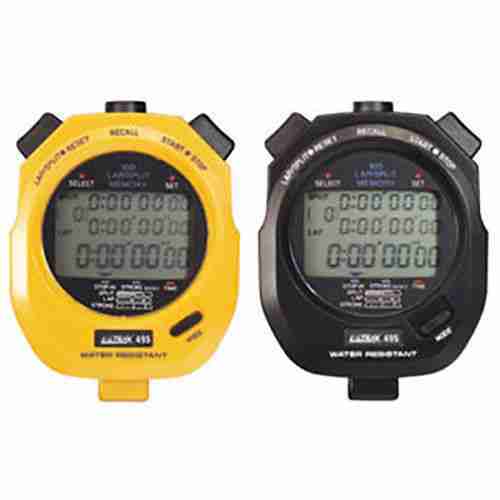 Take a look below to see our run-down of the top swimming stopwatches. The Ultrak 495 is generally considered the top dog when it comes to swim timers. This watch is a very common sight at swim-meets, and is rated very highly for its durability. Ultrak make a variety of timers with a focus on sports, including pedometers, stopwatches and timers. The Ultrak 495 is water resistant, an important feature for swimming. Keep in mind that water resistance is good, though it still isn’t the same as being waterproof. Imagine it dangling too far from your neck when you lean over the pool to congratulate a swimmer, or if you happen to be pulled in after a particularly big, victorious meet. Either situation could wreck your stopwatch, so if you’re using one of these, it’s best to take it off whenever it isn’t in active use. 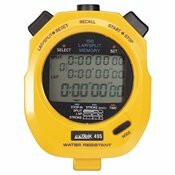 Easy to hit buttons are essential for a swim stopwatch. Hands might be wet or slippy, there can be condensation, and of course there’s adrenaline and stress on top of that. Hitting the right buttons, easily and quickly, is vital. This stopwatch has large chunky buttons which accomplish exactly that. Durability is another important feature in wet environments, especially those that tend to be made up of very hard walls and floors. Dropped watches happen sometimes, in fact impact damage is a leading cause of overall stopwatch failures, so having one which can survive multiple high impact drops is a blessing. With the Ultrak 495 Swimming Stopwatch you get this benefit too. It backs this up with a generous 5 year warranty as well, covering you against most types of damage. Memory features are usually a matter of preference, though almost everybody would like some memory retention to be permanent. The 5 year back-up battery in this stopwatch ensures safe storage of data between battery changes, even if that’s weeks apart. This is the kind of feature which puts this watch in top spot, especially since this and the warranty combine to give you 5 years of flawless usage at minimum. Ultrak have created this watch to be easily viewed in a hurry. Imagine you’re tensely watching a swimmer, waiting for the precise moment they complete a lap, eyes flicking rapidly to the display to see if it might be enough, then back to the swimmer. What if the display was too small to see with that quick flick? 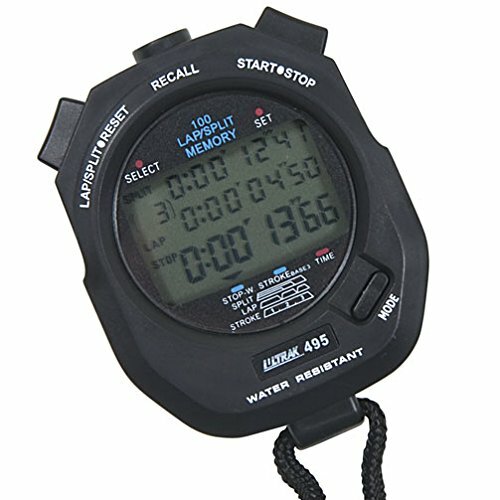 This stopwatch has a large and clear display, which also features dual split timers incorporated on a three row display. Easy to see even with condensation, this watch shows a variety of info at just a glance. For those who appreciate this kind of thing, the stopwatch is available in yellow or black. The choice is yours. Ultraks 495 stopwatch is a little more pricy than other vanilla stopwatches. This is balanced out a lot by the durability and warranty. You really do get what you pay for so while this might put some people off, I’d recommend it as a value over time item. The Learning Resources Simple Stopwatch is a stopwatch which stands out as being very colourful and easy to use. It was originally aimed at teachers and children. Since then it’s become known amongst other users as a good budget buy as well, and so has proven itself as a good stopwatch. There are a couple of features that make this easy to use. Firstly, there are three easy to hit buttons, that’s all. Red is for stop, green is for go, and yellow is for clear. This is a simple system for anyone to work with, and the watch itself has a comfortable to hold rounded shape. This is topped off with a grippy, non-slip surface. Even little hands should be safe holding this in wet conditions. The rounded design also means there are no edges or points for accidents to happen. It’s rounded, and nothing sticks out particularly far. On top of that, the battery compartment is securely shut with a small screw. 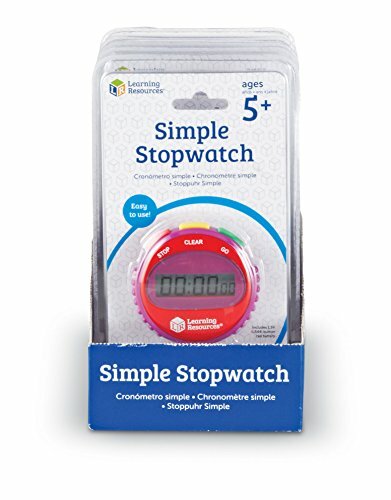 If a child uses the Learning Resources Stopwatch, they won’t be able to access the battery and pull it out, avoiding potential choking hazards. 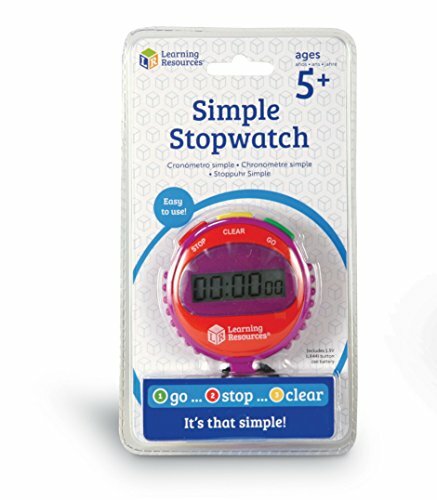 The Learning Resources Simple Stopwatch is available in three different bright, eye-catching colors. Children love the look and it really stands out, making the stopwatch tough to lose or leave laying around. The price for one of these stopwatches is below that of any advanced stopwatch. This makes it a cheap investment, especially for those unsure how much use they’ll actually get from a stopwatch. The display is large on this stopwatch too. Learning Resources Stopwatch has a big, clear display as the focus is on being clear to read. This isn’t the type of stopwatch which features a bunch of split timers or memory features. It’s a basic stopwatch and good as a beginning tool. Those who find a serious need for good stopwatch functions should definitely be looking to invest in an upgrade. The display is basic and remains on at all times. Battery draw is low so the longevity is still high. With that said, the display is only the current time. You can stop, go, or reset. That’s all. If you need more than that, you should also be looking at something more capable than the Learning Resources Stopwatch. The Garmin Forerunner 935 is definitely a step up in terms of investment, though it’s so much more than just a stopwatch. This is an all-around watch with incredible data tracking capabilities in water and on land. It’s dependable, stuffed full of advanced features, and looks great too. The advantage of this device is that you can use it whilst swimming, as it’s always on your wrist. For other swimming watches, take a look at our best watches for triathletes article. There are a great amount of pool features on this watch. For starters, there’s the obvious stopwatch. This is a fairly basic stopwatch, giving lap times and not much else, though this is enough for some users. The Garmin 935 also has a stroke detector and lap detector, which work automatically so you don’t have to mess with buttons whilst swimming. There have been some questions about the accuracy of these features though. GPS features allow you to track outdoor swim distances, while there’s a buzz alert feature which you can set up to go off after certain amounts of time or distance. On top of the swimming features, the GPS works for all other situations too. There are also downloadable workouts, phone connectivity, and a heart monitor. Combined with high battery life, this becomes a very versatile watch/tracker. It also has an altimeter, a barometer and an electronic compass built in. This watch is completely waterproof, with a rating of 5ATM which is roughly equivalent to 50 metres depth. That’s far more than any swimmer is going to need, in fact without diving equipment you’re never going to get close to that depth. As with most Garmin devices, the Forerunner 935 is known for reliability. It can take bumps, bangs and drops without missing a step. This and being waterproof mean it should last for a long time even with daily use. Phone connectivity gives the ability to use Garmins app and get extra workouts, and data tracking capability. The amount of data this watch gives is pretty high too, so while the stopwatch feature is a little basic, the overall info level is pretty high. Garmin have created this watch with performance technology that can track your performance and work rate. This features auto-stroke detection for swimming and also tracks changes in your heart rate to let you know whether you’re maxing out your potential or not. This is a big investment as it costs much more than regular stopwatches. This is a high-grade sports watch with many features. It isn’t for everyone, though there are certainly some people who could make good use of it. If the extra features sound like something you could do with, it might be worth the investment. Keep in mind the stopwatch features themselves are very basic and it only really allows lap timers. Things like multiple splits, multi-row displays and advanced data tracking aren’t available on this watch. 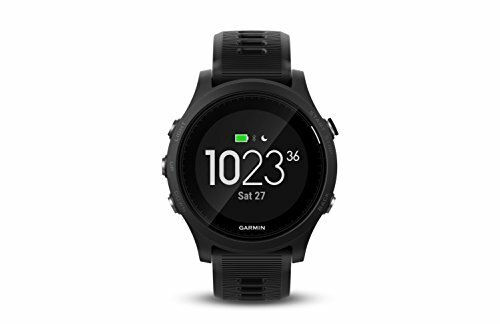 This makes the Garmin Forerunner 935 best for people who will get actual use out of the watch itself and other features, and not so great for dedicated swim usage. Smith Machines Vs Free Weights: Which One Is Best For You?